www.AskDrEldritch.com -- The Webcomic Gift Shop! Q. The Comic and Newsletter are free, why do I have to pay for these stories? A. My goal has always been to one day support myself entirely via my writing. The Minions and I discussed several possibilities for making this transition, and I have always opposed selling advertising space on my site, or shifting the comic and Newsletter to pay services. Selling my fiction to my readers by subscription seems a much better option. Q. How many stories will I receive in a year? A. I'm aiming for two stories each month, with no less than one per month. Q. What if I buy a few stories individually, then decide I want a whole year's worth. Can I apply the money I've spent to a Subscription? A. The Gift Shop will be configured to sell 12-month subscriptions starting from the date of purchase. But we're all about Customer Service, so if you want to retroactively apply your purchases to a subscription, send us an email when that time comes, and we'll help you out. Q. Can I let my Significant Other read the stories I receive? A. One Subscription may be shared among all members of one household, but stories are not to be otherwise distributed. Q. Are the Eldritch Stories age-appropriate for my children? A. In general, Eldritch Stories are probably unsuitable for children under the age of 13. We at Ask Dr. Eldritch strongly support parents in deciding what their children are allowed to view or read. If there is any doubt whether your children are ready to ready materials that may have scenes of violence, sexuality, and other mature themes, we recommend that parents vet all stories prior to letting their children read them. Honestly though, content of Eldritch Stories will probably be far less questionable than what is commonly heard on a junior-high playground. Q. How did you decide on your pricing? A. Scientists tell us that the Average American swallows approximately $2.65 of change each month in their sleep. So $2.08 per month seems affordable for most people who have Internet service. 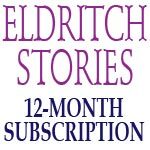 If more stories are published in a year, subscribers get even more value for their non-swallowed dollars! Q. I've been getting this weird rash in a, you know, Personal Area, and I was wondering what I should do about it? A. Seriously, people, I am not that kind of Doctor, and I really wish I didn't get these sorts of Questions so Frequently! Go see your Medical Care Provider. And please, don't tell me any more about your rash. Q. So, what are these stories going to be like? "Now, let's go through this again," the police inspector said. She was a surprisingly young brunette, whose attractive features were not enhanced by her hair pulled into a severe bun, and a grim set of her jaw. Eldritch sat across from her in the dining hall. A tape recorder lay on the table between them, and officers bustled around behind them. "Certainly, Inspector," Eldritch said. "I was visiting my uncle Owen, that's Owen Ga..."
"On second thought, let's not," the Inspector said, shutting off the recorder. "The rest of you, out. See that no one comes in here until I say so." She waited until the other officers had left the room, tapping her pen on the table. Eldritch merely watched her. "Right then," she said as the door clicked shut. "Let us cut, as they say, the crap." "I'm sorry, Inspector Darling, I don't understand," Eldritch said. "I've been telling you the truth." "Oh, yes, I'm sure you are," she said. "But I can't help but notice that everyone else I've spoken with this morning has told exactly the same story. The same events, the same details. That's unusual. I don't like things that are unusual." "I'm terribly sorry," Eldritch said. "Perhaps a career in Library Science might suit you better..."
"Don't," she said, and he stopped. They regarded each other for a moment. "See, I've heard of you," she continued finally. "Your name tends to show up in the sort of cases that we only tell other officers about because nobody else would believe them. Odd stories. Unusual stories." "That's not surprising, it's my job to help people in extraordinary circumstances. I do have my investigator's license," Eldritch said. "You can verify that by..."
"I know how," she cut him off. "But I'm not going to. Because I'm sure you have one. And I'm sure it's valid. That's the thing. On the surface, everything you say is true. But I get the feeling that there is a great deal you're not telling. That's what I have a problem with." "I am sorry to hear that, Inspector," Eldritch said. "I'm doing my best to be cooperative." "That's another thing," Inspector Darling said. "People being interrogated aren't polite and cooperative. They're angry, or upset, or sullen. They get annoyed about repeating the same story again and again. They don't make little jokes about Library Science." "To be fair," Eldritch said. "This is part of my job. You're not my first." "Of that I'm sure," she replied. "But I am trying to do my job. I want to know the truth." "In my experience," Eldritch said. "Most people who say that actually don't. They want some facts that fit their paradigm to their satisfaction." "I see," Inspector Darling said. "And that's what you told me, isn't it? Except I'm not satisfied. You see, if it was anyone else, I think it would be enough. But because it's you, I think there's something going on that you're not telling. Something untoward. So tell me, off the record, what do you think is happening, really?" "I think the arm in the box is..."
Want to find out? Subscribe now, and you'll receive this story when it's released! IF Eldritch Stories Items are the only ones in the Cart.